This little watercolor on canvas board is a celebration of spring --when it finally decided to grace my garden. The fall before these lovely little flowers emerged from the winter soil, I had rearranged the planting bed they were in. 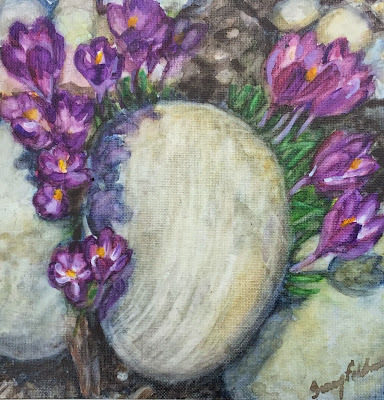 Clearly, I hadn't realized that the crocus bulbs were under the rearranged rock border. What a delightful surprise then when they pushed the rock aside just enough to emerge. This image really appeals to my Reality With a Twist sensibilities. The oval rock reminds me of a stylized head, and the crocuses (and their vegetation) look like a crown (and hair) gracing the rock. As soon as I saw it, I knew I'd eventually paint it, and knew too what it would be called. I hope you enjoy it as much as I did painting it. I'd love to know what you think. Like with many of my small works, I'm making it available to buy at auction in my Daily Paintworks gallery. And, as is typically the case, I'm going to start the bidding at much less than I'll charge at a show or on my website ($35). So, check it out.